Forumla one owes itself to Bernie Ecclestone, owner of Forumla 1 and part time MLB rosin bag. 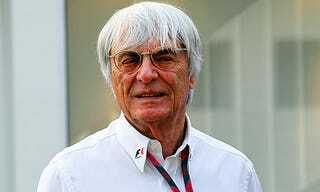 Bernie makes some of his money by having 2 daughters who will let you contract herpes from them for money but a majority of his cash comes from his holdings in F1. This season has seen viewership go up 100% and Vettel victories go down by 99% (I can not math well so just pick a number for the drop) which translates into people finally caring about the races. When people care they spend money as proved by that time my wife broke her leg and i felt bad so I bought myself some chicken. Bernie was created somewhere in europ, probably in a cave that is damp, by the green witch from cinderella who turns into a dragon. His only purpose in life was to make lots of money so he went to see a NASCAR race because it is best and is in america. He saw how the nascar cars drove and he said I want to do that to only with drivers with better fashion sensibilites. And forumla 1 was born. He founded F1 in the 60s with a large donation from Ferrari Motoria Sport-a tu Groupo and has let them make the rules as a thank you. F1 was good but michael schumacher took a break from skiing headfirst into trees to win 7 championships, 5 in a row and people became bored. Bernie went back to NASCAR to find more ideas. He saw a woman driving a nascar car and decided to give them a chance. After a long search for a female driver, Bernie found sebastian vettel crying outside a birthday party and told him to race cars. This has brought a big many girl fans to f1 which means f1 is making more money. But every cinderalla story must come to and end. People did not like Vettel because he would win races and still cry about things which is so totally bitchy. This year saw vettel losing more which brought back viewers on tv and radios with screens. Bernie ecclestones saved forumla 1 by making it nascar with fitted jeans and a v neck.